The entrance to the West Lofts apartment building in the former West Philadelphia High School building on 47th Street. 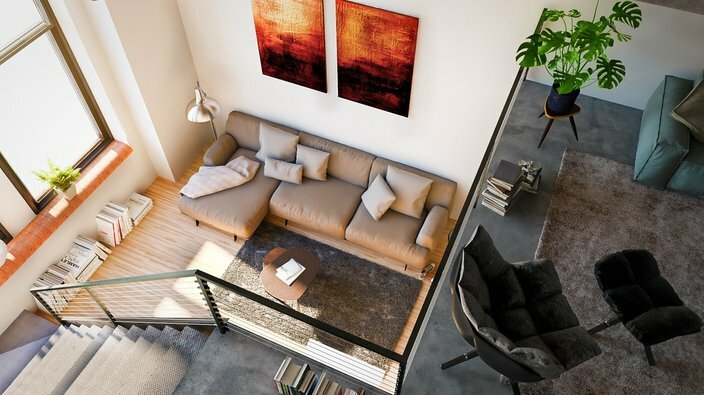 On a marketing website, renderings of the West Lofts depict modern apartments with a rustic flair in a building full of upscale amenities – like a brick-walled gymnasium filled with television screens and workout equipment. 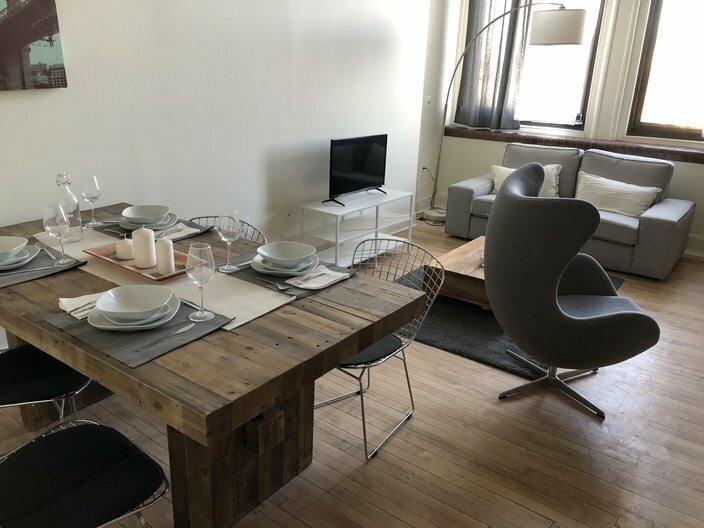 Housed within the historic walls of the West Philadelphia High School, the West Lofts are the kind of luxury apartments designed to entice the millennials who have flooded the city in recent years. Attracted by the life-like sketches, A. Conway Pedron, 32, and his wife, Christina Jackson, 29, signed a lease last May as construction continued on the four-story, two-wing building. The couple expected to move into a two-bedroom apartment in mid-August. But twice their unit was not ready, forcing them to secure housing via Airbnb. They finally moved into the building on Oct. 1, but only because they accepted an offer to live temporarily in a smaller studio apartment. Their promised unit remained unfinished. "Most of the building wasn't finished at that point," Pedron said. "We thought, 'Well, if it's only for a short time ..."
Two months later, still not in their contracted unit, Pedron and Jackson decided to break their lease. Life in the West Lofts, billed by the developer as a "full service historic building with unparalleled amenities," had been one of constant frustration. The couple moved out on Dec. 31 after suffering through multiple water interruptions, electrical outages and insufficient heat during a recent frigid spell, Pedron said. They also had safety concerns about the use of industrial propane heaters on the unoccupied first floor. Much of the building remains under construction, though two floors in the eastern wing are mostly filled with residents. A few live on the mostly unfinished fourth floor, too. 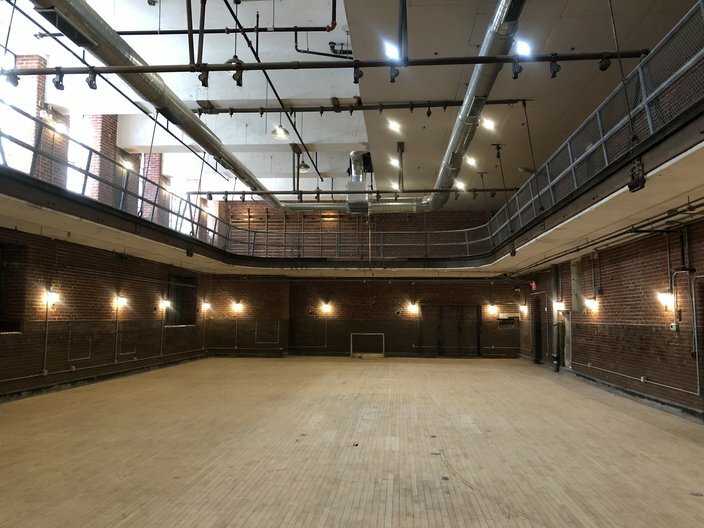 Many of the promised amenities – a restored gym with a suspended running track, a co-working space with a coffeeshop and landscaped gardens with bocce courts – remain unfinished, even as the West Lofts website describes them as if they are ready to be used by residents. "They're still advertising all of these things and telling the tenants that their rent reflects that," Pedron said. "Nothing is done." 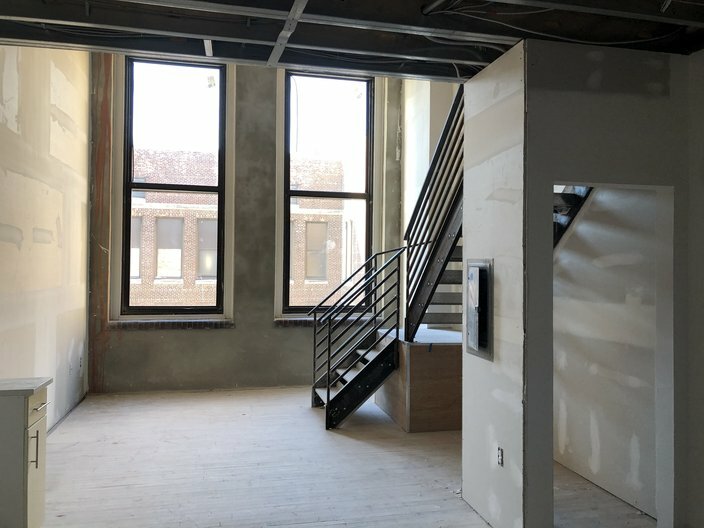 The fourth floor of the West Lofts, which is partially occupied, remains under construction, as do other parts of the building. The Department of Licenses and Inspections considers the building safe, having conducted numerous inspections. The developer, Andrew Bank of the Brooklyn-based Strong Place Partners, said residents understood they were moving into a building that was under construction. He acknowledged delays, but said residents have been compensated with a free month of rent. "Everyone who moved in did so without the amenities in place and with active construction in the building, so it was pretty clear what the circumstances were at the onset," Bank said in an email responding to a list of resident complaints. " ... We decided to redirect construction forces to finish the units that people were waiting to move into before completing the amenities, which pushed back the delivery date. "We were not happy about it, but we wanted to get people into their apartments, wherever possible." Despite residents' concerns about safety, the city Department of Licenses and Inspections has deemed the partially-occupied building safe, with inspections failing to turn up any code violations. Amid the turmoil, West Lofts' management company, the Jenkintown-based Galman Group, apparently intends to end its involvement with the property at the end of February. Pedron and Jackson are not alone in their frustrations. A private Facebook group – initially created to spark community among the building's residents – has transformed into a forum for complaints. • They told of frequent heating and water problems. And dust – plenty of dust. • They complained about uneven floors, awkward room layouts and open hallway windows – which allowed snow to blow into the building. • They claimed their utility bills have been estimated. • They questioned the safety of industrial-sized, propane heaters running continously on the unfinished and unoccupied first floor. 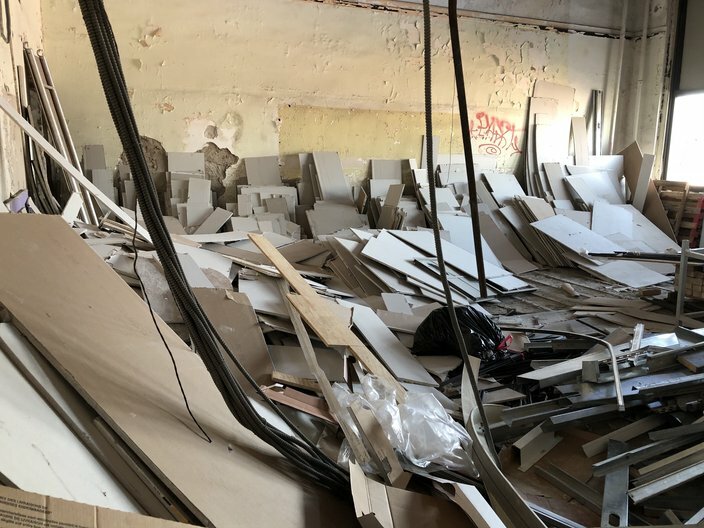 • And they wondered why there are not any signs restricting residents from entering unfinished areas of the building, with their piles of construction materials and debris. "This is literally what we deal with every day," said one resident, a 28-year-old man. "This is home." An overhead view of an apartment in the former West Philadelphia High School, now called West Lofts. When West Philadelphia High School opened in 1912, it marked the city's first secondary school located west of the Schuylkill River. Local students flocked there for a century. The late Gothic revival building – which encompasses an entire city block at 47th and Walnut streets – closed in 2011 after the School District of Philadelphia opened a new high school just a few blocks away. Strong Place Partners entered a bid to purchase the old school in 2012, intending to transform it into nearly 300 loft apartments. The development company pledged to preserve the historic character of the building, which is listed on the National Register of Historic Places. 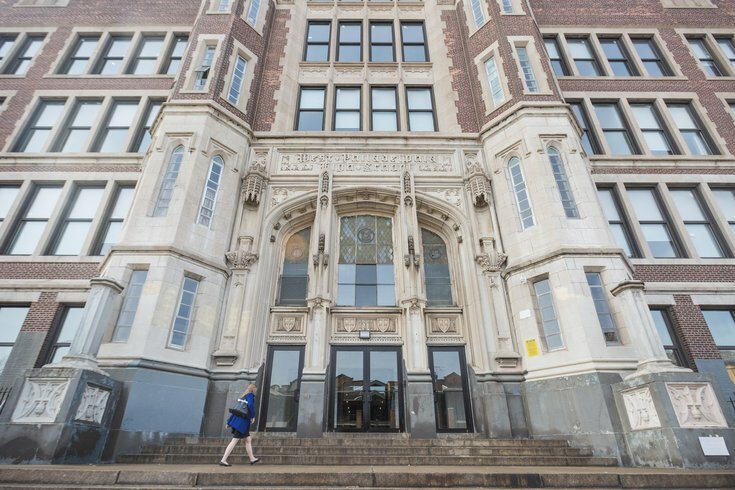 "Rather than remove all the historic elements in the original classrooms, as is common when schools get converted to apartments, to make the construction more straightforward we endeavored to keep as much of the original historic architecture as possible," Bank said. The project was expected to be finished by 2016. But the developers did not formally purchase the property until 2015, paying $5.1 million. Obtaining a construction loan also proved challenging, leading to further delays. In February 2016, however, Colliers International announced $24 million of financing for the acquisition and redevelopment of the vacant school. By May 2017, Strong Place Partners began scheduling appointments for prospective renters to see a model unit. And as tenants moved in last summer, the Galman Group began managing the property. When completed, the West Lofts will boast 268 apartments on two wings of the former West Philadelphia High School. The west wing remains completely under construction, but residents have questioned why there are not signs restricting people from entering. Once complete, the building is expected to include 268 apartments, including a variety of studio, one-, two- and three-bedroom units. They do not come cheap. 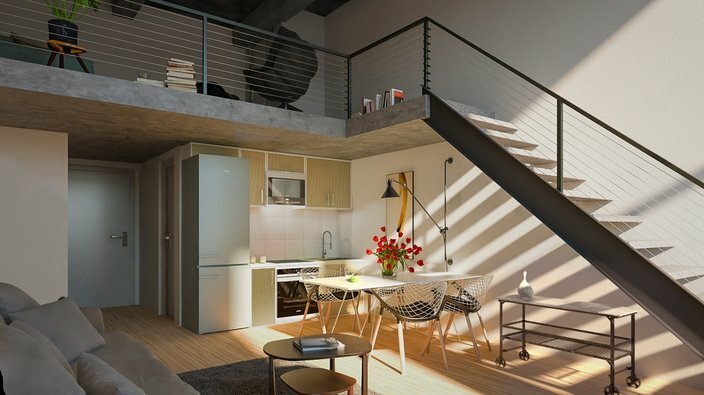 Pricing for studio apartments begins at $1,000 per month. One- and two-bedroom units range from $1,125 to $1,890 per month, and three-bedroom apartments are listed as high as $2,430 per month. West Loft residents said they are paying full rent on their units despite ongoing construction and unfinished amenities, though they acknowledged that the Galman Group provided a free month of rent as a signing bonus. Some received a second month for free. But they are struggling to see the value in their monthly payments. The three current residents who spoke with PhillyVoice said they are considering their options. One resident is actively looking for alternative places to live. Two others are staying put – for now. "It's all dependent on money," one resident said. "Let's face it." Additionally, the residents said there has been chatter of legal action. Their experience has been anything but what they anticipated. "The concept of it is good – that's basically what I signed up for," said one resident, a 31-year-old woman who moved into the building in September. "But the execution of it all is lackluster." Residents of the West Lofts say they had looked forward enjoying various amenities, including this restored gymnasium. But many of them, including the gym, are not yet in use. Before moving into the West Lofts, the woman lived in another rehabbed building in West Philly. She liked the feeling of being the first person to live in a rehabbed unit with new appliances and bathroom fixtures – a luxury offered by the West Lofts. She also wanted a place that was pet-friendly. And she was particularly excited to have a gym in her building. But more than four months after move-in, the only completed amenities are the laundry room – accessible only through unfinished hallways lined with dust – and a first-floor lounge filled with furniture and rec games. But residents said the lounge – which opened around Thanksgiving – is too cold to use. On a recent Sunday afternoon, with temperatures outside in the teens, the lounge was absent of people except for a security guard wearing a winter coat and using a space heater by his desk. The gym appeared nearly ready, with finished floors and a heating system in place. But there was no equipment, nor an "active yoga studio with classes regularly," as described on the West Lofts website. "I signed my lease in June," the woman said. "At that point, it was said that all the amenities would be done and ready in September. When it became closer, it became apparent from looking at the building that their timeline had changed." 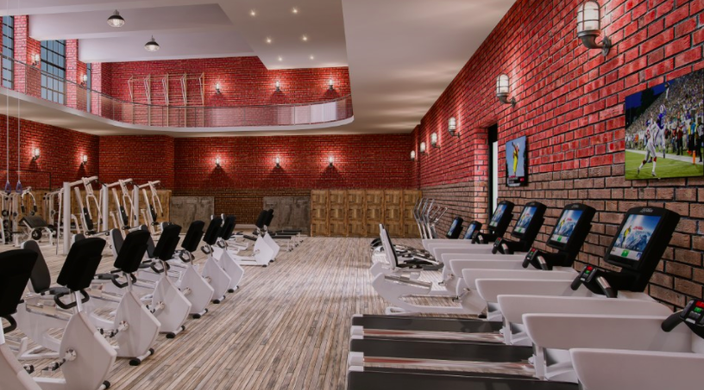 This rendering shows the finished gymnasium – full of workout equipment and with televisions mounted on the historic brick walls. According to Bank, the delays with finishing some units are a result of efforts to maintain the historic character. There are more than 70 different unit configurations, a more complicated endeavor than installing drywall in repetitive layouts, he said. "As a result, some apartments took a lot longer to complete than anticipated and meeting leasing commitments forced us to make other arrangements for some tenants," Bank said. That, in turn, has pushed back the developers' timeline for completing the amenities, Bank said. The amenities should be "in full service" by next month. But Bank said there have been some misunderstandings about the amenities available to residents. "Co-working was never a resident amenity," Bank said. "It is a separate project and business, not with a specific time frame. Parking is not part of this phase of the project and is not mentioned anywhere in any marketing materials." 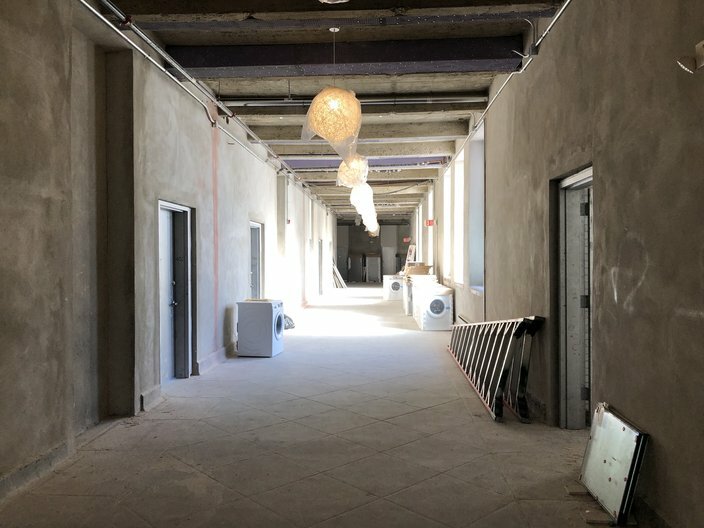 As an active construction site, dust naturally lingered throughout the hallways, where lighting on the ceiling was covered in protective plastic. Inevitably, it made its way into individual units, the residents said. Outside the lounge, several industrial propane heaters roared so loudly they could be heard on the floor above. Other hallways contained uninstalled appliances. Graffiti in one hallway apparently dated from the days when the building sat empty. Trash bags sat near a stairwell, a trash chute unavailable. On the doors of some apartments, tenants hung signs instructing construction workers not to let their cats loose. To a certain extent, they expected conditions to be less-than-perfect – at least until the building was complete, they said. But they have had less patience for the problems in their individual units. West Lofts residents have complained that many units, like this unfinished apartment on the fourth floor, contain awkward layouts. They claim the location of coaxial cables, stairs and supports make it difficult to set up their rooms comfortably. The biggest frustrations have included issues with the heating system, particularly as frigid temperatures set in for a long stretch in late December and early January. Residents said the HVAC units in some units blow nothing but cold air, because they lack heating coils. That prompted the building's management to install auxiliary space heaters in the affected apartments. But residents said the space heaters struggled to keep room temperatures in the mid-60s. One resident, a 47-year-old man who moved in last summer, called the heating issues "insane." Snow has even blown through his window casement, he said. Last week, maintenance crews installed heating coils and insulated his windows, he said. But the mounting frustration has taken a toll: he is ready to move elsewhere. "It's like a slow-motion train wreck when you're watching it unfold," he said. Last year, residents said, they faced frequent interruptions to water service. One lasted several days, prompting numerous complaints, according to Pedron. "All the tenants complained," he said. "They left a case of bottled water outside everybody's door as compensation. As if we were supposed to shower in bottled water for a week." At another point, one resident said, the lack of water pressure made brushing her teeth difficult. Bank said efforts to connect new piping to the original infrastructure took longer than anticipated, acknowledging that "water service to the tenants was problematic" during that period. That work is now complete, he said. As for the heating issues, Bank said Strong Place Partners has contacted the manufacturers to obtain the parts needed to make the glitchy HVAC systems run properly. Those parts are in the process of being installed. "While we were waiting for the parts, we endeavored to make everyone comfortable as quickly as possible, which has included some temporary heating solutions," Bank said. "We are switching those out to permanent solutions." 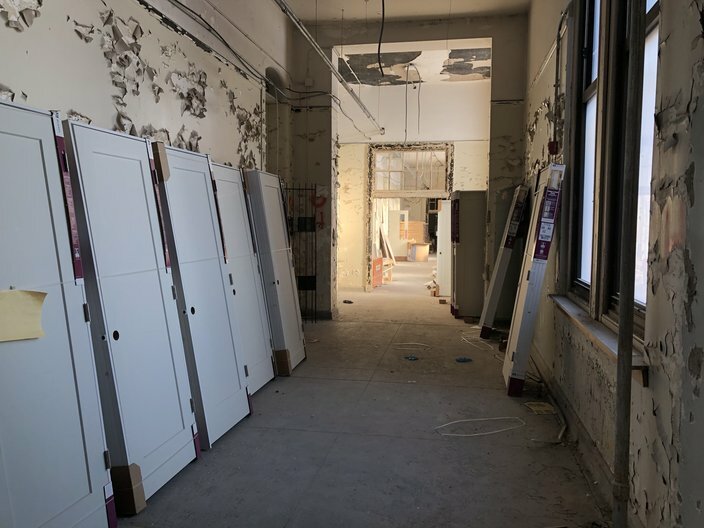 Residents say they were shown this model unit in the West Lofts, a luxury apartment building under construction in the former West Philadelphia High School. But they claim many units have awkward setups that do not reflect the spaciousness of the model unit. But the residents have also complained about the layouts of the units, saying they lack the quality of the model apartment – a one-bedroom unit that comfortably fits a sofa and dining room set by a view showcasing the city skyline. Instead, many rooms have awkward setups or odd features, the residents said. In some rooms, the coaxial cable is installed in places making it difficult to place a television and furniture without feeling cramped. Stairs jut out into living space. Some overhead beams force the tallest residents to duck. Pedron said his studio apartment lacked a bathroom door. Another resident said the oven in his temporary unit did not work for a month and that his leased loft did not include a bedroom door. And another complained of floors not being sealed properly. Bank claimed residents were given an opportunity to see their leased units "as many times as they liked" before making a decision. "We have over 70 different layouts so the model unit really just showed the finished concept, not an exact replica of every unit available," Bank said. "Every bathroom has a door, but in the loft style apartments with open, high ceilings, not every sleeping area is totally private." Construction debris is piled in a room on the partially-occupied fourth floor. Moreover, residents have questioned the safety of the large propane heaters, the lack of signs restricting people from entering unfinished areas and the use of duct tape to cover sprinkler heads in unfinished apartments. But the building is safe, according to the city Department of Licenses and Inspections, which has conducted frequent inspections, Communications Director Karen Guss said. There have been no code violations at West Lofts, and required permits and licenses are in place, she said. The developers have secured temporary certificates of occupancy that allow the building to be partially occupied while construction continues, according to L&I. The propane heaters are permissible and monitored by fire watch patrols at "frequent, regular intervals," she said. There are "proper separations" between unfinished areas and the occupied portion of the building, which is "fully sprinklered." "Inspections, including one just last week carried out by a team of L&I inspectors and a (Philadelphia Fire Department) fire code captain, have found no code violations," Guss wrote in an email. "Whether the tenants have cause to be dissatisfied or even grounds for legal action against building ownership/management is another matter entirely, outside of L&I's purview." 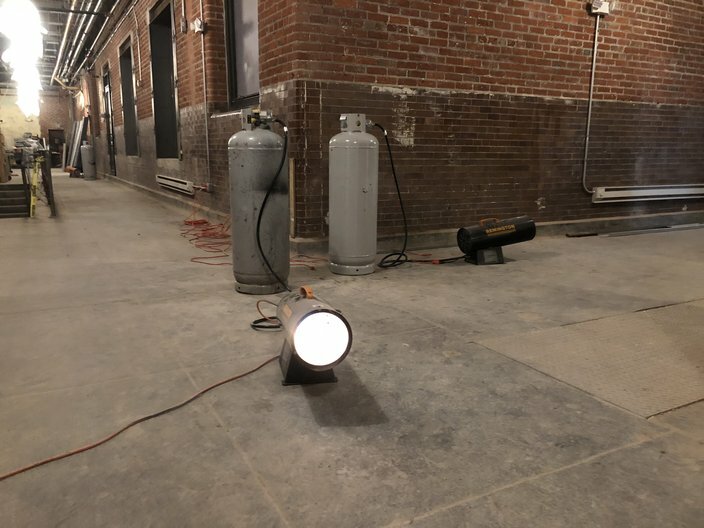 Bank insisted the propane heaters are "a standard solution" to an active construction site and that appropriate barriers and signage are in place. West Lofts residents have questioned the safety of the industrial propane heaters running continuously on the first floor. But the Department of Licenses and Inspections says they are acceptable because they are being regularly monitored. With the building deemed safe by L&I, that leaves residents essentially embroiled in a landlord-tenant disagreement. The Galman Group did not directly respond to messages seeking comment. But Bank said Brian Paule, the managing company's director of property management, forwarded a list of resident complaints submitted by PhillyVoice. Still, the Galman Group's days at the West Lofts look to be numbered. In response to a complaint Pedron filed with the Better Business Bureau, the Galman Group said it will no longer manage the building after February. "Unfortunately there have been many construction delays in delivering units as well as the common areas," the document read. "The construction punch list items are out of the scope of our management assignment. The Galman Group is not the developer of this project. "We take great pride in our reputation and so because of the many delays in construction that are beyond our control, we have made the business decision to stop managing this project as of February 28, 2018." Renderings like this one, which show a completed unit, helped attract A. Conway Pedron and his wife, Christina Jackson, to the West Lofts. Pedron and Jackson moved out of the West Lofts last month, but they are still trying to recover the $1,450 security deposit they paid at the beginning of their lease. A lease addendum stipulates that they must forfeit their free month's rent to break the lease. The deposit covers that free month. Yet, after all their frustrations living at the West Lofts, the couple wants the deposit back. The Galman Group agreed to terminate their lease early, but asked the couple to sign paperwork waiving their right to litigation. Pedron has refused to sign it. They really don't want to pursue legal action, Pedron said, but they are leaving their options open. "We're trying just to get our money and get out," Pedron said. "If they push back on the deposit, then we'll do the legal stuff."